Diabetes Mellitus (Type-2) forms the core of this therapeutic segment and it needs to be viewed in conjunction with metabolic syndromes that increase the risk of cardiovascular events. India has been declared as the diabetic capital of the world by leading agencies like IDF ( International Diabetes Federation), ADA (American Diabetes Association) and WHO (World Health Organisation). 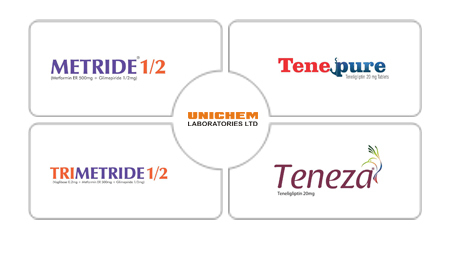 Unichem is trying to establish itself as a leading anti-diabetic company by aggressively pursuing newer molecules like Gliptins to help manage type-2 diabetes. The company’s association with general practitioners, consulting physicians, diabetologists, endocrinologists and cardiologists is helping it to gain foothold in the fast growing market of oral anti-diabetic drugs (OADs).